Our simple MTP to LC duplex fanout allows you to split the parallel 12-fiber link into individual duplex connections. 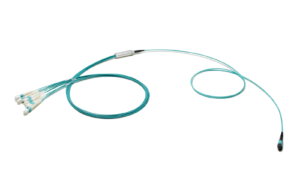 The round thin cable, combined with the compact and robust design of the Duralino fanout, allows rapid deployment of high density patching in SAN and LAN in DataCenter. 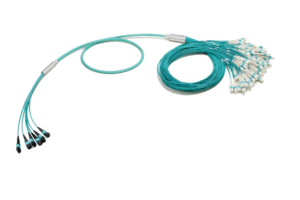 The ruggedized version of our MTP to LC duplex fanout allows you to split the parallel 12-fiber link into individual duplex connections. The double jacket round cable, combined with the compact and robust design of the Duralino fanout, allows rapid deployment of high density patching in SAN and LAN DataCenter environments, where additional cable protection is necessary. The 2xMTP to 12xLC duplex Duralino fanout combines the need for a thin and very compact cable and the need for a high bandwidth connection. 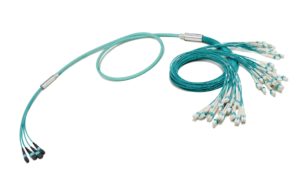 Just 3.8mm of cable contains 24-fibers, offering portable and compact cabling that creates a secure transition between the MTP backbone cabling and discrete LC duplex connectors. This product is an ideal solution for interconnecting a 4x12f MTP 48-fiber backbone link and a patching area or active equipment rack. With MTP keyed connectors on one side and fiber marking on the other, installation is quick, simple and error-free. This product is an ideal solution for interconnecting a 6x12f MTP 72-fiber backbone link and a patching area or active equipment rack. With MTP keyed connectors on one side and fiber marking on the other, installation is quick, simple and error-free. The micro-bundle cable with central strengthening member is suitable also for vertical deployment. 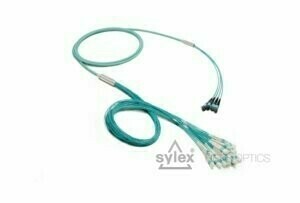 This product is an ideal solution for interconnecting an 8x12f MTP 96-fiber backbone link and a patching area or active equipment rack. With MTP keyed connectors on one side and fiber marking on the other side, installation is quick, simple and error-free. 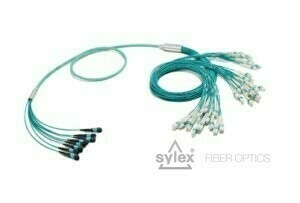 Use this cost saving, factory pre-terminated and tested cable for quick and handy installation in any DataCenter where space is at a premium. 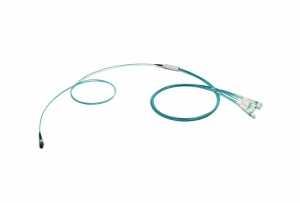 A Full backbone cable with diameter less than 9mm split to duplex LC connections available for direct patching of active equipment or different network segments. 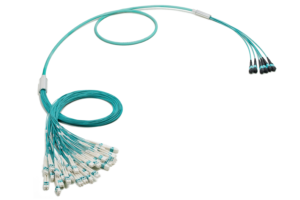 By reducing cable bulk, easing fiber management and optimising DataCenter airflow, this is the best option for high-bandwidth, easy-to-deploy cabling. 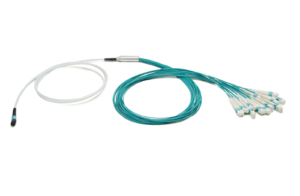 This compact cable and connectors offer high-data throughput. This is the key characteristic of this fanout, combining a round thin cable and 12 duplex LC connections saving valuable DataCenter rack space. This product is ideally suited for a high density environment that demands space saving and innovative cable management solutions. 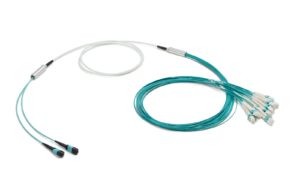 The small MTP connector footprint on one side and furcation tubing on the LC duplex side allow them to be used as standard patchcords. 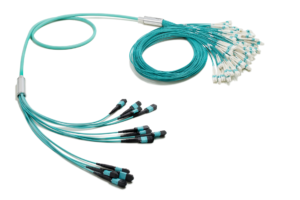 This product is an ideal solution for interconnecting a 72-fiber backbone link and a patching area or active equipment rack. With MTP keyed connectors on one side and fiber marking on the other, installation is quick, simple and error-free. The micro-bundle cable with central strengthening member is suitable also for vertical deployment. Designed to provide a high density interconnection that uses minimum space, it is an ideal solution for patching active hardware in DataCenters. 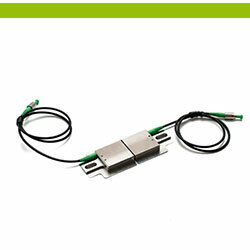 The MTP connector offers high density connectivity and the fanout part provides 48 duplex LC connectors. 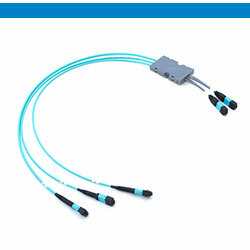 The product offers small cable diameter (less than 9mm), small number of backbone MTP connectors and easy-to-install duplex LC connectors. A simple to install fanout, that optimises cable-routing and takes less space in trays and cable ducts. 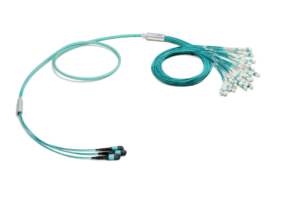 A product that creates a secure transition between MTP and LC duplex connectors where additional fiber protection is a must. 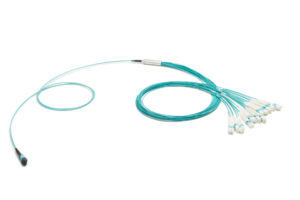 The ruggedized corrugated Miniflex tube helps withstand any possible damage to the fiber during installation. Thanks to its robustness this product doesn't need additional protection from the conduit. 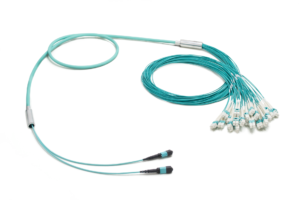 By protecting the fiber on its route from one active device to another the Miniflex fanout cable ensures that even non-professional treatment of the fanout cable will not jeopardize the data interconnection. 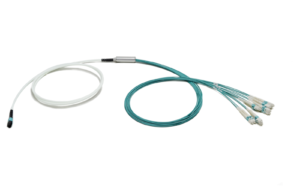 This product provides a secure transition between MTP and LC duplex connectors in a thin, robust and flexible "cable". 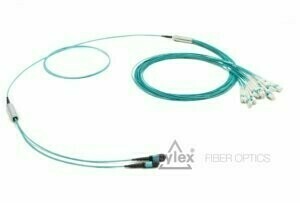 The ruggedized corrugated Miniflex tube helps withstand any possible damage to the fiber during the installation. Thanks to its robustness this product doesn't need additional protection from the conduit.